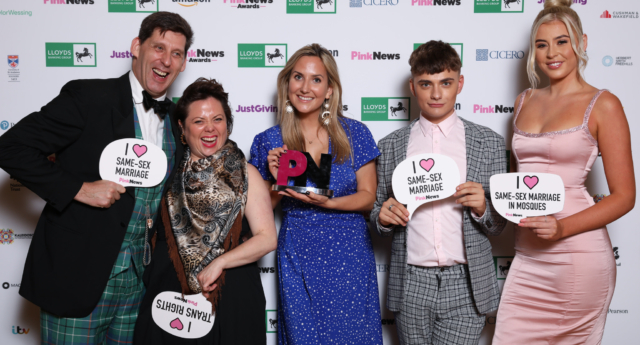 Nominations have officially opened for the PinkNews Awards 2019. In October, PinkNews will celebrate the best and brightest in LGBT+ equality, following on from the success of 2018’s blockbuster ceremony that saw winners including Ed Miliband, Will Young, A Very English Scandal and the founders of Stonewall. Last year, PinkNews awarded Business Equality to Macquarie Group, Public Sector Equality went to the Royal Navy and Royal Marines, Community Group was won by Cara-Friend and The Rainbow Project, and Third Sector Equality was won by the National Trust. For 2019, PinkNews is introducing a brand new award—Role Model. The Role Model Award will recognise one person who has made an indelible difference in the fight for LGBT+ equality around the world in the last year. The award is open to role models ranging from activists, politicians, entertainers and more. Do you think your business or organisation deserves recognition at the PinkNews Awards 2019? We are opening up nominations for businesses, third sector organisations, public sector organisations, community groups, and, of course, role models, to submit their applications now. For more information about the PinkNews Awards click here.